Jan 28, 2017: Can I mount a speaker ON this column? Jul 10, 2017: KEF R100 &amp; R200c Speakers Placement - Mount/Float/Shelf? Dec 20, 2017: Wall mount recommendation for DefTech SR9040? Dec 26, 2017: Ceiling mounts for Fluance satellite speakers? Jan 04, 2018: Here's my gaming station, made some changes will update soon. Feb 02, 2018: Admiring this before taking it down for my new monitor! 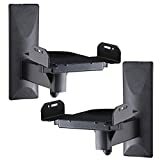 Apr 11, 2018: Anyone useing wall mounts for small mixing monitors? May 05, 2018: My man cave, not the best photo. May 06, 2018: My man cave, not the best photo. Nov 02, 2018: RGB is still cool right? Nov 06, 2018: Is the speaker to close to the TT? Apr 10, 2019: A Comfortable Place.